The Village Times Herald published this piece in print on Sept. 22, 2016. A young scientist at Stony Brook University received a $2.3 million grant to fund research he hopes will eventually lead to new therapies for the treatment of autism spectrum disorder. Matthew Lerner, Ph.D., is an assistant professor of clinical psychology at Stony Brook University, and director of the Stony Brook Social Competence and Treatment Lab, the focus of which is learning to understand how children and teens with ASD form friendships. His work thus far has ranged from lab-based studies — evaluating and developing tools to measure what is happening during social interactions and how the brain processes those interactions — to real-world applications. Lerner’s previous studies ask how, when and if kids make friends, and what helps them do so. Efforts to link these two levels of analysis have never been done simultaneously — until now. Lerner won a highly competitive National Institute of Mental Health award to fund his innovative approach to studying social behaviors of children with ASD. Priscilla Arena, the leader of a support group for parents of children with ASD, said Lerner is excited about the potential the grant gives his research. It’s not far from her initial reaction after meeting with the Stony Brook researcher, who asked permission to speak to the parents in her group. The Suffolk Aspergers/Autism Support and Information co-founder wanted to protect the parents, who have “already been beaten and kicked” by others looking for monetary donations and permission to study their children. But when she met Lerner, she said she knew almost immediately that he was different. The award, called Biobehavioral Research Awards for Innovative New Scientists, was created in 2009 as a way to provide younger scientists with financial support for research. It is for early-stage investigators who are on a tenure track and have no prior research project grants. “BRAINS” is earmarked for “the most promising early investigators” and is “one of the most competitive [awards]” NIH offers, according to Lisa Gilotty, Ph.D., program officer of Lerner’s grant. 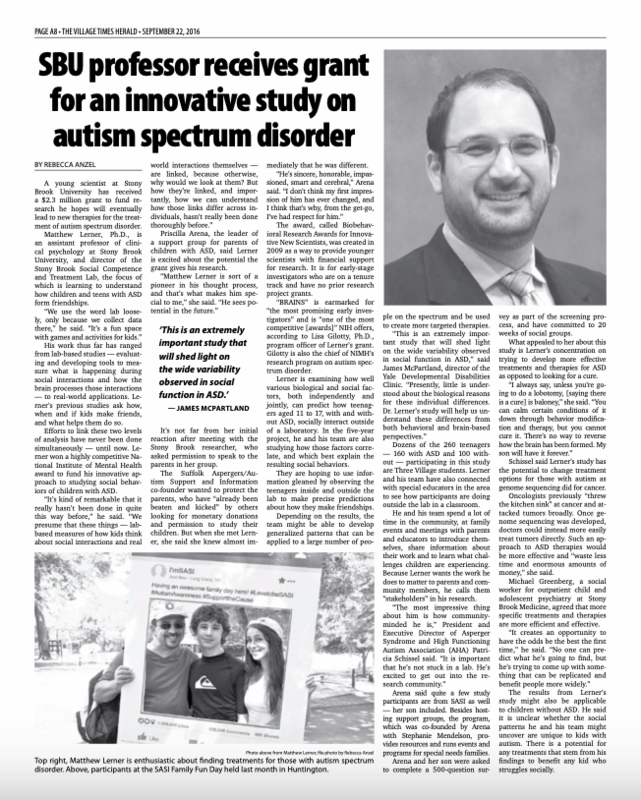 Gilotty is also the chief of NIMH’s research program on autism spectrum disorder. 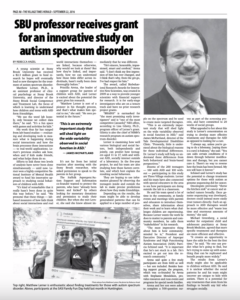 Matthew Lerner is enthusiastic about finding treatments for those with autism spectrum disorder. Photo from Matthew Lerner. Lerner is examining how well various biological and social factors, both independently and jointly, can predict how teenagers aged 11 to 17, with and without ASD, socially interact outside of a laboratory. In the five-year project, he and his team are also studying how those factors correlate, and which best explain the resulting social behaviors. They are hoping to use information gleaned by observing the teenagers inside and outside the lab to make precise predictions about how they make friendships. Depending on the results, the team might be able to develop generalized patterns that can be applied to a large number of people on the spectrum and be used to create more targeted therapies. Dozens of the 260 teenagers — 160 with ASD and 100 without — participating in this study are Three Village students. Lerner and his team have also connected with special educators in the area to see how participants are doing outside the lab in a classroom. He and his team spend a lot of time in the community, at family events and meetings with parents and educators to introduce themselves, share information about their work and to learn what challenges children are experiencing. Because Lerner wants the work he does to matter to parents and community members, he calls them “stakeholders” in his research. Arena said quite a few study participants are from SASI as well — her son included. Besides hosting support groups, the program, which was co-founded by Arena with Stephanie Mendelson, provides resources and runs events and programs for special needs families. Arena and her son were asked to complete a 500-question survey as part of the screening process, and have committed to 20 weeks of social groups. What appealed to her about this study is Lerner’s concentration on trying to develop more effective treatments and therapies for ASD as opposed to looking for a cure. Schissel said Lerner’s study has the potential to change treatment options for those with autism as genome sequencing did for cancer. Oncologists previously “threw the kitchen sink” at cancer and attacked tumors broadly. Once genome sequencing was developed, doctors could instead more easily treat tumors directly. Such an approach to ASD therapies would be more effective and “waste less time and enormous amounts of money,” she said. 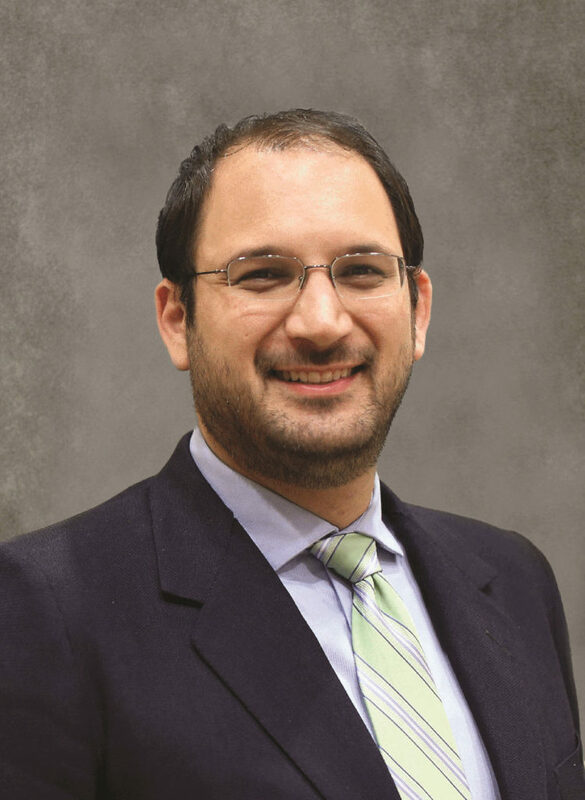 Michael Greenberg, a social worker for outpatient child and adolescent psychiatry at Stony Brook Medicine, agreed that more specific treatments and therapies are more efficient and effective. The results from Lerner’s study might also be applicable to children without ASD. He said it is unclear whether the social patterns he and his team might uncover are unique to kids with autism. There is a potential for any treatments that stem from his findings to benefit any kid who struggles socially.